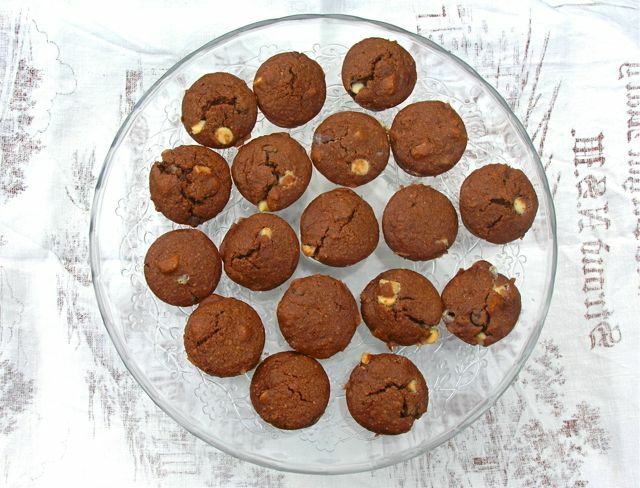 These chocolate nut cakes – for to me they are more cake than muffin – are made with a little rye flour, Baileys and lots of nuts and chocolate. How could I resist? They were also meant to be made with spelt, but as I’d run out of that at the time, I used our local stoneground wholemeal flour instead. I made a number of other changes too, according to what I had in the house and the size and quantity I wanted. Henk reckons his recipe makes twenty large muffins, I wanted to make twenty four large mini cakes, if that makes any kind of sense. I’m a big fan of little cakes. You can eat one with little guilt, but the two or three mouthfuls you get make it seem quite substantial. And then, of course, you can always have a second. I can see why these chocolate nut cakes are a favourite with Henk. They are easy to make, moist, flavoursome and have a surprisingly light sponge. The nuts add texture and the chocolate chips give bursts of sweet and rich unctuousness. The baileys added a note of luxury and the flavour came through surprisingly well given there wasn’t an awful lot of it in the mix. Ten out of ten I reckon. 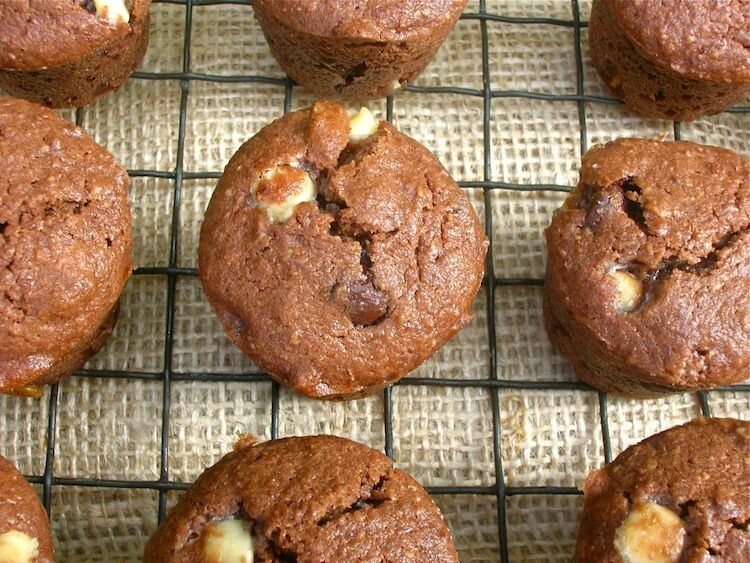 Little chocolate nut cakes made with wholemeal flours and filled with chocolate chips. The sponge is moist and surprising light. Melt the butter and sugar in a pan over a small heat. Whisk the dry ingredients together in a large bowl to ensure there are no lumps and everything is well mixed. Stir in the chocolate and nuts. Make a well in the middle and add the sugar mixture together with the eggs, yoghurt and Baileys. Stir from the inside out until everything is just combined. Divide the mixture between 24 mini silicone muffin moulds, filling them almost to the top. Bake at 180C for ten minutes, then turn the oven down to 150C for a further ten minutes when the cakes should be well risen and firm to the touch. Allow the cakes to rest for a few minutes in the moulds, then turn out onto a wire rack to cool. Can make 12 regular sized muffins instead of 24 mini ones. With the use of our local stoneground flour and eggs, I’m sending this recipe off to Elizabeth’s Kitchen Diary for Shop Local. Mmmm, I bet these are really moist & moreish. Also love the idea of using Baileys in a cake recipe, clever Henk! I agree with you about little cakes! It also means that everyone can choose how much they want – light eaters can have one, greedier people can have two or three haha 😉 These look yummy! oh my word… Bailey’s cupcakes… I could do this with mint bailey’s! Amazing! Mint Baileys Dom? Really? Gosh! They look very neat as well as delicious Choclette ! Good idea to make them in this size. Thanks for posting my recipe; I consider it an honour :)) As with the cookies and the buns, I am confused about the difference between muffins and cakes. As long as they taste good I am not too bothered though …. Glad you approve Henk. Thanks again for the recipe. As for cookies, biscuits, muffins, fairy cakes, buns – the list goes on – we English love to debate what should be called what and we all think differently, so no wonder it’s confusing. Can I get Henk to send me a recipe to – esp if as good as this one? I completely agree Choclette – little cakes versus bigger ‘uns and the teeny ones always get my vote! Trouble is I can’t stop at one, especially I suspect if baileys is involved! Well Henk is a pure genius is these are anything to go by! Weirdly, we’ve experimented with different flours for bread making and yet never for cake making! Thanks for the thought, I need to get on to this!!! Rye in the mix, weirdly gives quite a smooth texture to cakes I’ve found. I’ve tried loads of different flours and quite like buckwheat as part of a mix too. I love the recipe especially the innovative use of both white and dark chocolate, macademia nuts a personal favorite of mine. I haven’t used Bailey’s and Yogurt together , that sounds quite interesting! Thanks Prateek. All those flavours and textures make for lots of depth and interest. I too am a fan of macadamia nuts – they remind me of sunny days in Australia. The cup cakes look perfect and nice .. The ingredients are so wholesome. I enjoy baking with rye and spelt a lot. I think they give cakes and muffins a lot of character and that nice depth of flavor. Thanks Christine, baking is so much more exciting now that we have such a glorious wealth of ingredients at our disposal. I’m seriously fond of nut cakes and, for some reason, they seem perfect for winter afternoons with a cup of something warming. These would fit the bill just perfectly. Baileys is not exactly my favourite drink but in baking it’s a different story. I confess to loving the word basterdsuiker, by the way. Haha Phil, it’s a great word Phil and had me smiling when I saw it. I guess we’re all programmed to eat nuts at this time of year in the UK, so it just seems right. Oh these look great! Perfect for Christmas! Thes look so yummy. I love baking it soothes me. I don’t have a huge sweet tooth so I end up giving it away but it looks like this wouldn’t be overly sweet. These look really wholesome! I’d like to get to know Dutch goodies better as they seem to have quite a few! Yes, me too Sarah. I keep wanting to explore more German ones too. It’s very nice to read all these positive comments ! To properly explore the German pastry world I’d suggest to reserve another life after this one. And two if you’d like to include Austria and Hungary, which share a similar tradition. There is so much more than just Sachertorte and Schwarzwälder Kirschtorte. Haha, yes, I think that’s why I might not have started Henk. As for the comments, you are a talented baker. Another lovely recipe Choclette! Now…… where’s that bottle of Baileys?? I’ve used Bailey’s in a few bakes now and it does seem to work very well …… hic! Now what a splendid idea GG. I still haven’t quite figured out what I’ll be making for Christmas gifts this year, but this is a possibility.